Effective May 13, 2010, in accordance with the recently passed animal ordinances, it is a requirement for all dogs and cats, 6 months or older, who reside in the city limits of Springdale to be micro-chipped and registered with Springdale Animal Services. Annual licensing of pets has been discontinued and replaced with one-time microchip registration. For more information, click Springdale Animal Services. Home Again is an advanced lost pet recovery service dedicated to the safety and well-being of your pet. Our system is best utilized when a microchip with a unique ID number is injected between the shoulder blades of your pet, which can be done by a veterinarian if your pet is not already micro-chipped. Once your pet is micro-chipped, the next step is to enroll your pet's microchip ID, description, and photo, along with your contact information, in the Home Again National Pet Recovery Database, which is critical to reuniting you immediately with your lost pet once he is found. Although the microchip needle is larger than a typical vaccine needle, the general rule is this…your animals will react the SAME way to this shot as they do to any other. No better, no worse. Animals do not over react to it. Their physical performance is not impaired and there is no scarring. You are not injecting any substance that can burn or irritate; the chip is completely bio-compatible and non-offensive. Can the microchip move around once inside? 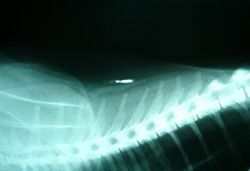 When properly implanted, a small layer of connective tissue forms around the microchip, preventing movement or migration of the chip. Instructions and injection sites will vary depending upon the species.